Units A7A and A7B in North City Business Park, at J5 on the M50 are just 3 months away from practical completion. The units measure approx. 20,136 sq. ft. and 20,172 sq.ft. respectively. These are high-bay warehouse facilities with approx. 20% office accommodation. Internal heights rise to just over 10 metres while other features include an extensive secure service yard, dedicated car parking, 2 dock levellers each with tailgate loading and one roller shutter door at grade. Not far from this, further progress is being made in Dublin Airport Logistics Park. Heron House, Rohan’s latest development, is a 48,760 sq.ft. 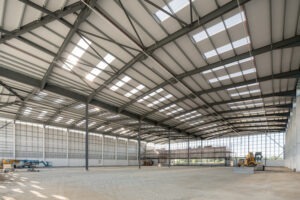 high-bay warehouse facility with approx. 10% office accommodation. It will boast an internal height of 12 metres, an extensive secure service yard with a depth of 35 metres, 47 dedicated car spaces, five dock levellers with tailgate loading and two roller shutter doors at grade. These three new units will be finished to Rohan’s typical high standard and will be completed in September 2018. For further details, please contact Peter Levins or Jamie Rohan.